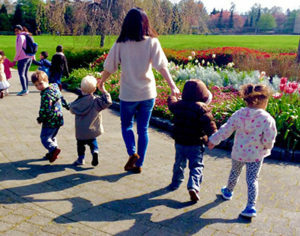 Each year families and their three- to five-year-olds are invited to their neighbourhood school to attend a fun-filled Ready, Set, Learn event, where they can meet school staff and a variety of community service providers. Ready, Set, Learn is about providing information about how to support a young child’s early learning and development. This is an invitation for all 3-5 year olds to come and play! The Ministry of Education supports Ready, Set, Learn throughout the province, in collaboration with the Ministry of Children and Family Development, and the Ministry of Health. Details on Ready, Set, Learn events at District schools will be posted in spring each year. 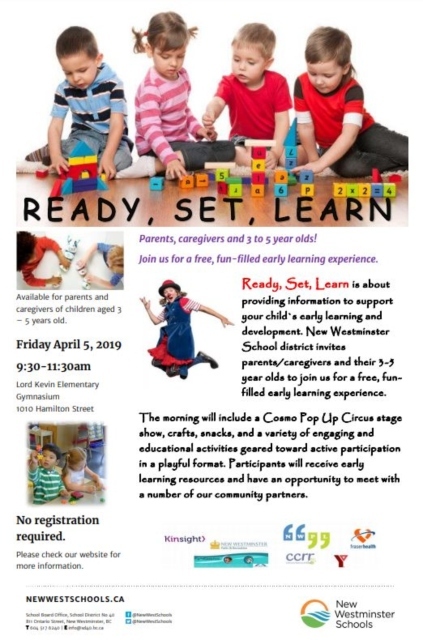 Join us for a free, fun-filled early learning experience on April 5, 2019. Ready, Set, Learn is about providing information to support your child’s early learning and development. The morning will include a Cosmo Pop-Up Circus stage show along with crafts, snacks and a variety of engaging and educational activities. You will receive early learning resources and have an opportunity to meet with a number of community partners. See our poster and book the date!